Power School 2013 Part 2: Historic Journals of the Powernaut! Powernaut: Home 1912 1941 1944 1945 (with Stories) 1948 1954 1955 1962 1966 1968 (with Stories) 1969 1976 1979 1984 1985 1987 2005 (with Stories) 2006 (with Stories) 2009 (with Stories) 2011 (with Stories) 2012 2013 . Attack of the Terrible Three! 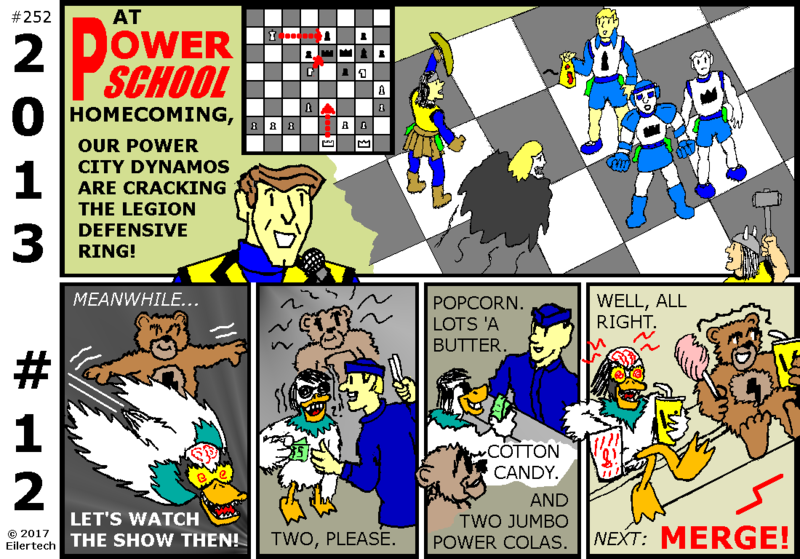 The Power School Homecoming game has a stadium full of superheroes vs... three others, known to Powernaut Comics and teaming up for the first time ever! It's an even match... Let the games continue! (signed) Scott Eiler, Publisher for Powernaut Comics, 2013. Bonus Section: Paulie's ONLINE Pen Pals! That chessboard says, you could just push pawns up to become queens, and then swarm the Legion. So why is this climactic battle three on three? Not my decision, but I think I understand it. 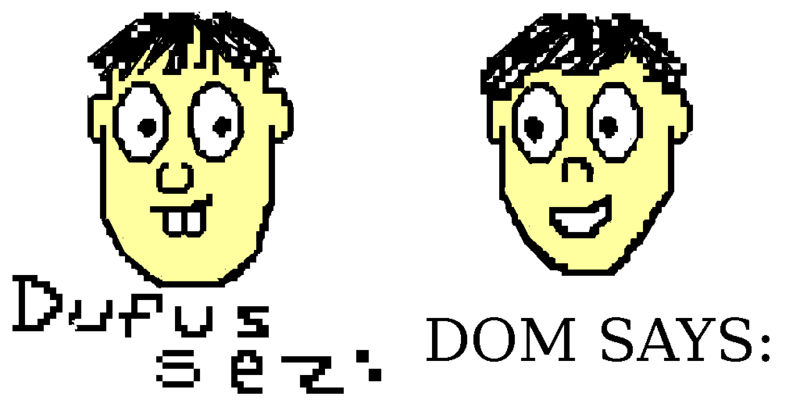 Dom felt that Wiki Boy's powers might somehow take multiple people out of the game at one time. Only one would be taken off the board, but others would be effectively out of game somehow. Hipolyta wasn't going to let that happen. 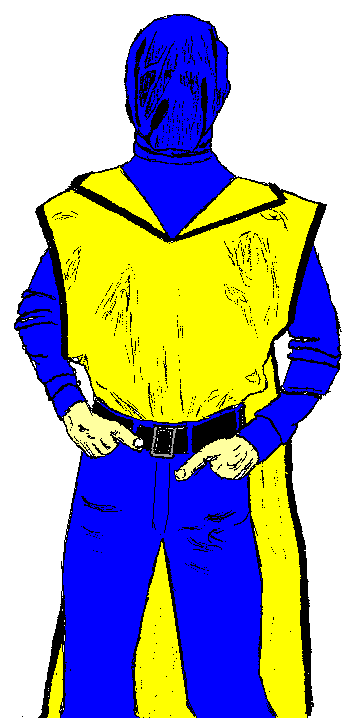 So we didn't bring in more players, before we tested Wiki Boy. Or so went the plan. Anyway... It's good to hear from a fellow chess fan! huh huh, someone spanked the ninja. I don't know all the cool powers an Ultimate Ninja might have. But "Survive Getting Slapped Like a Mosquito" must be among them. Perhaps the superhero teams should consider all attacking at the same time, not trying "After you, Alphonse. No, after you, Gaston." as a combat tactic. Not politeness, so much as reaction time. The whole battle took less than five minutes. Yes, we had a stadium full of superheroes vs. three supervillains. But the superheroes had never all worked together before. And most of them were busy getting people to safety. So it was really an even fight. By the way, I love your stories about The Girl Who Saved The World! And I had no idea you had such a great amount of published work. I'm fascinated *and* confused! I think something cool happened maybe. I'll just say, it was weird but it might work out well. Maybe the next comic will explain. If Spanker 4 merged with someone before this, why isn't he still merged? And who's that guy in the merge picture? Spanker 4's merge partners broke up with him. So to say. As for that guy in the picture... That's from before a reality shift which led to the formation of our universe. I had to look up the guy's name: "Wyatt Ferguson". He was working with Coach Powernaut. Somehow we still have that picture, and that history alongside our own. I think it's related to why the other Powernauts went on that space mission. It's as though the universes might be colliding again sometime. I don't have a lot to say about this series, that the characters and I haven't already said. I'm just having fun with all these characters in one place. I've described it as, Laff-a-Lympics meets World War Hulk. The only question remaining is: Does anyone really want to reconvene to finish the Battle Chess game? (signed) Scott Eiler, 26 October 2017. Powernaut: Home 1912 1941 1944 1945 (with Stories) 1948 1954 1955 1962 1966 1968 (with Stories) 1969 1976 1979 1984 1985 1987 2005 (with Stories) 2006 (with Stories) 2009 (with Stories) 2011 (with Stories) 2012 2013. The story and all artwork in this fiction are copyright © 2017 by Eiler Technical Enterprises.